I don't mean the kulit side....destroyer, endless questions about things you aren't ready to discuss yet, climbing everything 'til you're on the verge of a heart attack...I'm sure you can all relate to those. Sometimes annoying and yet still endearing when you look back. I'm talking Brain Smart, Body Smart and People Smart. My daughter is a triple threat and I'm sure yours is too. I believe all kids are, you just have to know where to look and what to acknowledge. Nikola isn't the smartest in her class but she always manages to finish in the Top 10 and I'm fine with that. She's quick on the uptake and street smart. She flourishes more when books are accompanied by practical learning. At the end of the day, I don't need her to give me a medal at the end of every semester. I value balance more because I don't want memories of her childhood to be all about studying. And that's what brings us to the next type of smart: People Smart. I encourage her to converse with adults and new friends so when she gets older, she knows how to communicate with all types of people. At just 8, she can already carry on a conversation with most adults and even joke around. She is quite funny, actually. Her sense of humor is endearing and people enjoy spending long hours speaking with her. I personally think that's more important than constantly being at the top of her class. Charm and rapport is a gift that can't be learned in school. Indeed, I am a proud mom and in my eyes, my daughter is perfect. How about you? What makes your child special? JOIN MY GIVEAWAY TO WIN Progress Pre-School Gold Milk and a surprise gift that your child will surely enjoy! 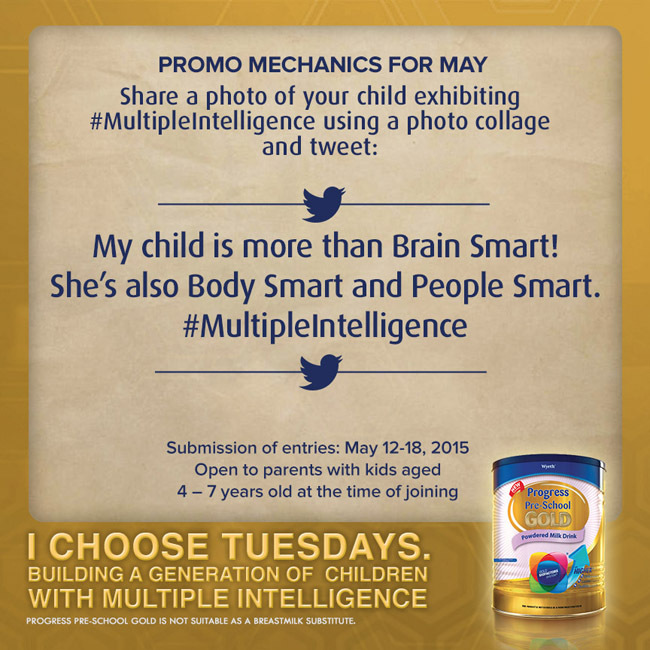 Share a triple photo collage of your kid and tweet: "My child is more than Brain Smart. She's also Body Smart and People Smart #MultipleIntelligence #FExMI". Good day! This is my tweet post: https://twitter.com/jasfabbabie/status/599609388140142592 Thank you. Good day Mommy Sarah! Here's my tweet post: https://twitter.com/jasfabbabie/status/599608746357096451 Thank You! Hi! Here's my entry: https://twitter.com/jrstwitz/status/599611715320320000 More power! Hi! Here's my tweet post: https://twitter.com/jrstwitz/status/599611403717054464 Thanks!